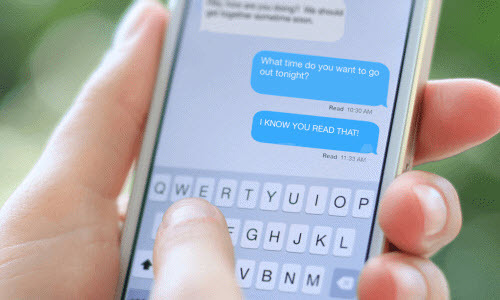 As more and more people prefer to texting and sending messages to friends and family, texting messages has become the vogue instead of making phone calls. Text messages you send can always express more than what you can with speaking over the phones. The meaningful messages therefore turn out to be the most important data on your iPhone. Supposing you have received a funny message from a friend and want to save it to your Mac computer, what should you do? Of course, you can back up the messages to Mac through iTunes, and you can restore them to your iPhone whenever you need to. However, you cannot extract the messages selectively to Mac for more meaningful managing and editing. In light of this, I would like to introduce a powerful and easy-to-use third party utility that can export and back up iPhone messages to Mac without iTunes. iFonebox which is the most renowned third party iPhone data recovery software over the market, is the magic tool. It can extract the text messages and transfer to Mac machine without bothering to launching iTunes. Here are the detailed steps about how to back up iPhone messages to Mac selectively. > Install and run iFonebox on your computer. 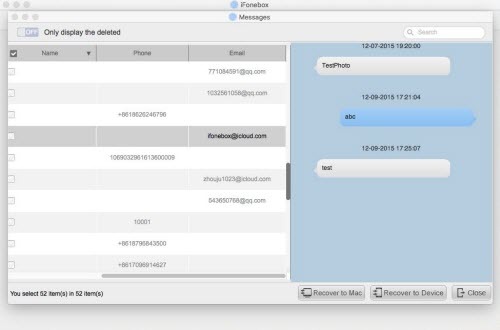 Note: iFonebox is available for both Windows and Mac version, you need to download and install the Mac version of iFonebox to back up iPhone messages to Mac. > Connect your iPhone to your Mac machine. > Click Start after your iPhone is recognized by iFonebox. Note: If your iPhone is not recognized by iFonebox, please check whether you have plugged in your iPhone properly and whether you have trusted your computer on your iPhone. > Choose Messages to scan selectively by clicking on the icon for Messages app from the interface listing all the supported data categories. > After the data scanning and analyzing is finished, all the iPhone messages will be presented in list for previewing and selecting. > Select the messages you wan to back up to your Mac computer and then click “Recover to Mac” to transfer the messages to your Mac machine for backup. How To Back Up iPhone Contacts to Computer? How To Transfer iPhone Messages Conversation to Mac? This entry was posted in Backup/Back Up, iPhone, iTunes, Messages and tagged back up iphone messages to mac, save iphone messages without itunes by IosdroneD. Bookmark the permalink.